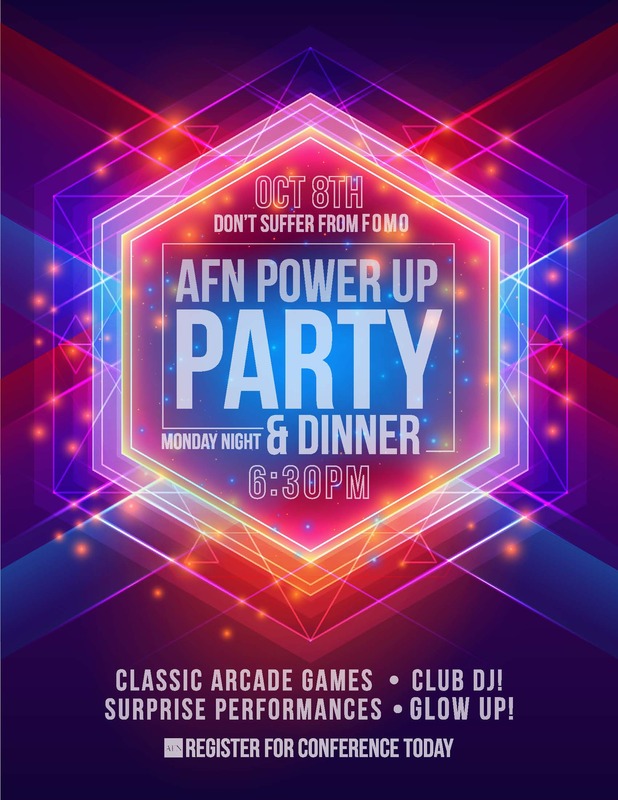 Don't miss the AFN VIP weclome reception! 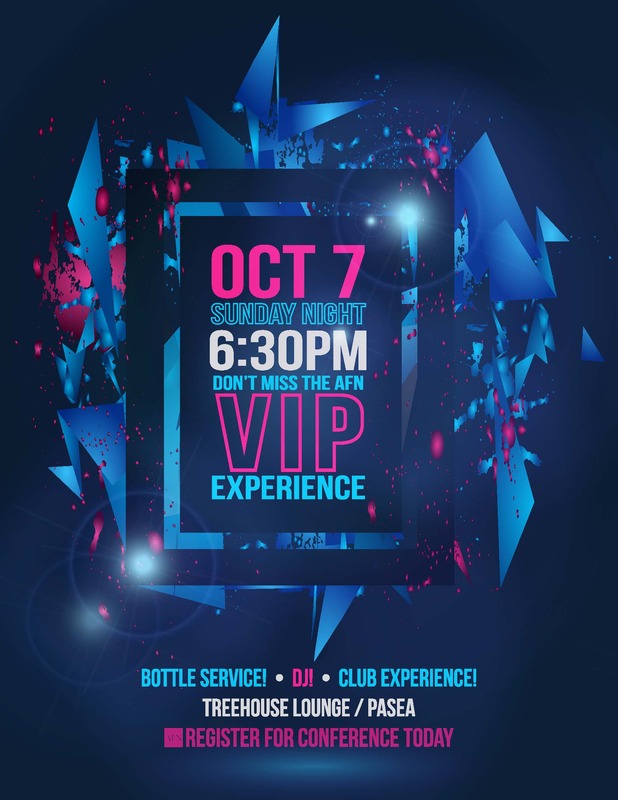 Enjoy a club experience at Tanner's Treehouse Lounge, with bottle service and DJ! Drinks and Heavy Hors D’oeuvres provided. Please dress business casual for this event. Enjoy a buffet style breakfast and a chance to network with sponsors and peers. Please stop by the Registration/Information Desk upon arriving for your first session to pick up a name badge and Conference Goodie Bag. Over the course of the conference, visit the desk during desk hours if you have questions or need assistance and we will be happy to help you. Anthony Casillas will set the tone of the event with this uplifting opening session. Jack & John will share the exciting vision for 2019, with an emphasis on new technology being released to AFN branches. Department Leaders present on important updates. General conference information will be discussed. A short break to refresh, grab coffee or check emails. Dale Vermillion will present on how to stand out from competition, build strategic REALationships, and avoid the pitfalls. Enjoy lunch with fellow Branch Managers, with an ocean view and a chance to network with sponsors. Breakout sessions in smaller group atmosphere to develop and learn about a specific areas. Take this time to check out the Pacific City (a shopping area next door) or have a drink at the roof top bar overlooking the pool. If you are staying with us; drop off your conference items, relax and refresh in your luxurious Pasea room. Join us for an exciting night of dancing, classic arcade games, club DJ and more! Enjoy surprise performances and dinner with an oceanview. Dress code: Smart Casual. Click here for more info! Enjoy breakfast and a chance to network with sponsors and peers. Visit the Registration desk during desk hours if you have questions or need assistance throughout the day and we will be happy to help you. Anthony will bring the Team AFN Fusion into this presentation, highlighting 33 Pillars for Branch Success Duplication for Team AFN. Barry Habib, CEO of MBS Highway, presents “Survival of the LO.” Learn how to survive as an orginator by 2020 and avoid extinction. Join us to learn about agent marketing tactics. This closing session to bring you a new perspective on marketing for success. Jack and John Sherman will wrap up the conference with closing remarks.